Preliminary Chart of Hampton Roads and Elizabeth River Virginia. 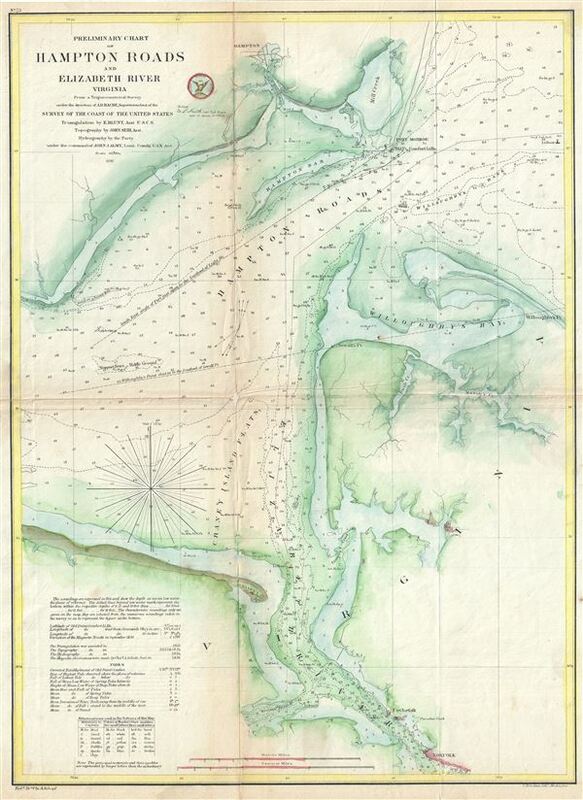 An attractive 1857 U.S. Coast Survey maritime map or nautical chart of Hampton Roads, Virginia. The map covers from Hampton Virginian south along the Elisabeth River to Norfolk Virginia. Hampton Roads in . Hampton Roads comprises the Virginia Beach-Norfolk-Newport News metropolitan area. It is an important entrance to the James River. The Triangulation for this map was completed by E. Blunt. The Topography is the work of J. Seib. The Hydrography was completed by a party under the command of J. J. Almy. The whole was compiled under the superintendence of A. D. Bache, one of the most influential and prolific heads of the U.S. Coast Survey. This map was published in the 1857 edition of the Superintendent's Report. Average. Some wear and toning on original fold lines. Backed with archival tissue for stability.